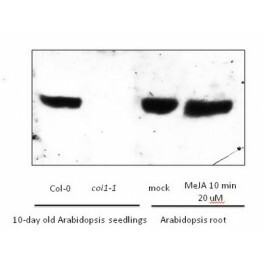 Antibody detects 100 ng of recombinant COI1 protein, expressed in Hi5 suspenstion insect cells. COI1 (Coronate insensitive 1) is an esential component of jasmonate receptor. Required for jasmonate-regulated plant fertility and defense processes, and for coronatine and/or other elicitors perceptions/responses. 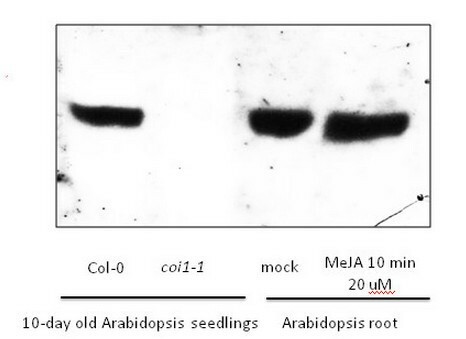 Alternative names: F-box/LRR-repeat protein 2, AtCOI1, AtFBL2. adhering to the cap or sides of the tubes. Add 50 µl of sterile water.